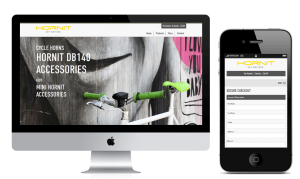 A new responsive E-commerce website has been launched for The Hornit- The Worlds Loudest Cycle horn. The creator. Tom de Pelet, is an ex-lawyer and Ironman (11hrs 26 mins in case you’re interested!) turned entrepreneur. His experience commuting and training on the roads in and around London made him realise cyclists are far safer when they can get themselves noticed rather than relying on other people to see them: a driver won’t run you over if they know you’re there. Having tried whistles (difficult to breathe hard and keep it in your mouth), shouting (it’s aggressive and always after the incident) and the other products on the market (not up to scratch), he created a prototype Hornit dB140 cycle horn (patent pending) that could be heard by drivers inside their vehicles and was safe and easy to use while braking. Over the years so many other cyclists asked him where they could buy one that he looked into how to make it commercially. The result is that the the Hornit dB140 is now widely distributed in over 30 countries worldwide. The Mini Hornit was created so kids could even more fun while riding their bikes and scooters and learn to interact with safety at the same time. Safety is all about getting noticed! Check out the new website here – www.thehornit.com.